I guess that by now everybody is familiar with the film can bare-bulb flash trick. If not, head over to photojojo and see hoe easily you can make one from an old film container. I guess the Lomo Colorsplash is a little less known. If you’ve never heard of this one, head over to the Lomography realm and have a look. deth2all from DIYP Instractables group came up with an ingenious way to combine the two. By using the famous Lee filters (They will ship them free to your door), deth2all was able to add the color transformation “feature” to the bare bulb film container flash. See the full tutorial here. There are two nice things with this trick: The first is that you are not limited to the handful of colors the original Lomo had built in. The other niceness (can I say that ????) is that you do not need to buy a Colorsplash Lomo (though I highly recommend getting any Lomo you can put your hands on), you can use this on top of your DSLR. If you’re on the PhotoJoJo mails, you must have gotten that awesome time lapse bit. On that post they recommend the Cannon TC80N3 – a round 100 dollars device that give you the ability to take time lapse images. (It is called Intervalometer, but I can’t even say it, let alone write it and feel good about myself). The good guys at the DIYP Instructables group have done it again. 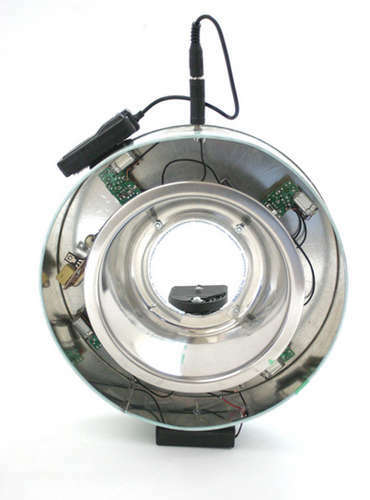 You may remember this group from the Minty Strobe, A Great Way to Build a Ringlight and many more. Chris Thompson came up with a cheap and fun Time Lapse Photography project. If you build one of those please leave a comment here. It is amazing what you can do with one 1/4" bolt, a washer and a piece of string. 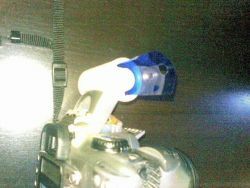 With less then 1$ at Home Depot, you’ll get a tiny stabilizer for your camera. The maker of this flick claims to gain 3 stops. I’d bet on around two, but it is good enough for 1 buck. If you are grabbing this with RSS, you can get the full video here. For a more complete guide, check out the String Tripod over at DIYP group at instructables. Be warned, though, over there you might end up with a two dollars expense bill as they use more part and get more stabilization. usefulguy from DIYPhotography’s Instructables group has posted a pretty neat Instructable explaining how to make a photo studio compression pole. It kinda reminds me of the hardware store light-backdrop stand, but it is even easier to use. The good news is the cost: all the parts cost 9.43 at Home Depot. Real cheap for an all purpose studio stand. There is some great stuff going on at DIYPhotography.net instructables group. This fantastic group is a true demonstration of the DIY spirit that is behind this site. I have talked before on the subject of creating your own flash. In that article Avner Richard explained how to utilize xenon tubes to create some real Watts/Second power flashes. It is a great piece for the ones that are electrically capable. Reader Bankara has followed up on the cheap ringlight article with another very affordable ringlight. Not as cheap as the one you can get from your LCD, but still way cheaper then the ones you get in stores. He has posted an instructable on how to build one of those monsters babies.